This lean protein entrée is an excellent choice for the winter season and for entertaining dinners. 1) Combine oil, garlic, thyme, rosemary, salt, and pepper in a small bowl. Rub all over meat, pressing to adhere. Cover and refrigerate 2 hours. 2) Preheat oven to 400°F. Place meat fat side up in a shallow roasting pan. 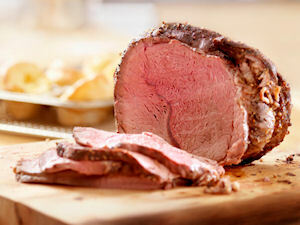 Roast 1 hour or until internal temperature reads at least 145°F. Remove from oven, cover with foil, and let rest 10 minutes. Slice and serve.